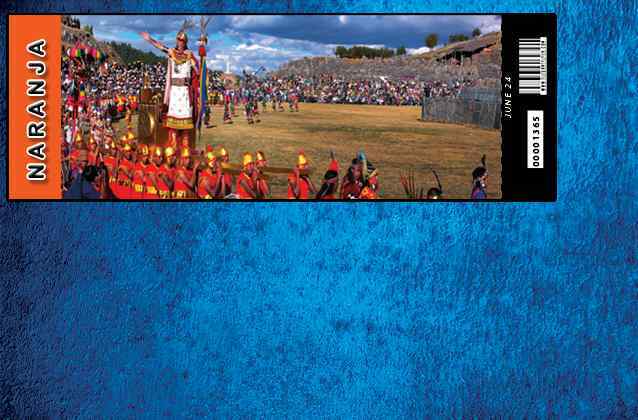 The Inti Raymi orange ticket gives you access to the preferred seating section in Sacsaywaman. These seats are the closest to the stage with a distance of 10 meters or 32 feet. These seats are not only closer to the stage but also are the best seats for taking pictures as the Sun will be behind. Inti Raymi, the Festival of the Sun, is celebrated in Cusco every year on the 24th of June where thousands of people come together to witness the most beatiful re-enactment of the most important festival of the Inca empire to celebrate the winter solstice and the harvest season; the beginning of the Sun's New Year. The Inti Raymi is now the second largest festival on the South American continent and for this reason you must book this tour well in advance. A week-long celebration begins prior to the new year festivities with concerts and street fairs. The delivery of your ticket is not included. You must pick up your ticket on June 24, the same day of the Inti Raymi from 10:15am to 10:45am at Plazoleta Santa Teresa (5 min walk from Main Plaza). There will be a check-in table. Transportation to Inti Raymi venue is not included. You are responsible to get to the Inti Raymi Explanade at Sacsayhuaman by 12:30pm on your own. All streets are closed so you have to walk from Cusco city center 1.8km or about 40 minutes. Because all streets are closed, you must be able to walk a minimum of 1.8km or 40 minutes from the Cusco city center to the Inti Raymi venue. After the event, you must walk back to the Cusco city center also. Our friendly staff will wait for you between 10:15am and 10:45am at Plazoleta Santa Teresa, where you will pick up your Inti Raymi tickets at the check-in table with your passport. You are responsible to get to the Inti Raymi venue on your own. You must be at the Inti Raymi Explanade at Sacsayhuaman by 12:30pm. All streets are closed so you have to walk from Cusco city center 1.8km or about 40 minutes. You will go through the official entrance check-point. At the entrance, you will receive the Inti Raymi program booklet that will help you follow along what is said during the ceremony. You will also receive a DVD as a souvenir. The representation of the Inca is one of Pachacutec, which is the Inca in which the sun god (Inti) revealed his might and strength. The armies come from the four quarters of the Inca Empire and there are different ceremonies, dances, fires, and more. The ceremony lasts about 90 minutes and is in Quechua but visually is powerful. You will be able to follow along with the booklet given to all participants. If during the Inti Raymi, a traveler abandons the festival due to altitude, health, or for any other reason, no reimbursement will be made and no claim accepted. You agree to cover all expenses made by you due to abandonment of the event such as meals, hotel, return transportation, medical expenses, etc. It is compulsory that all clients have personal travel insurance. This insurance must cover personal accidents, medical expenses, loss of property and all other expenses which might arise as a result of loss, damage or injury occurring to the client. The Inti Raymi might be interrupted or even canceled due to weather conditions, natural disasters or other disturbances such as civil unrest, worker strikes, etc. In the case the Inti Raymi is canceled for your safety, we will work with the ticket supplier to obtain a refund only when the suppliers agrees to do so.